Colorful, vibrant and proclaimed as the "Art Coast of Michigan", the sister cities of Saugatuck and Douglas are a favorite destination for visitors in every season. If this is your first time to these waterfront communities, you're in for a treat. If you're returning for another year, you know the kaleidoscope of ever changing art works, festivities, fine eateries and activities makes for a wonderful vacation. As the Kalamazoo River slowly makes it's way to Lake Michigan, it curves around downtown Saugatuck to create a wonderful riverfront for strolling the boardwalk and waterfront dining. Boats steadily make their way out to the big lake, the Star of Saugatuck paddle boat cheerfully chugs by, and the hand-cranked chain ferry provides pedestrians a shortcut to the other side of the channel. Downtown shops offer fine art, handmade confections, lovely home decor, whimsical souvenirs and wine tasting. Arrange for a sail on Lake Michigan, explore the Felt Mansion, thrill the family on the Saugatuck Dune Rides, splash along on a Duck Boat tour, or climb Mount Baldy. You're going to need an entire week or multiple visits to take it all in! The main street through downtown Douglas leads directly from Blue Star Highway to the riverfront park. Douglas is far from a one street town, however. Explore an eclectic mix of restaurants from classy to casual, and retro to traditional. Browse the art galleries for a stunning new work for your home, or get your creative juices flowing when you paint your own pottery. Near Wade's Bayou Park you can rent kayaks or stand up paddleboards to explore the calm, marsh waters of Lake Kalamazoo. Downtown Beery Field is home to the Douglas Dutchers, an old fashioned baseball team, and a small playground nearby adds to the iconic small town feel of Douglas. Just a short distance from Douglas you'll find a brewery with live music and multiple antique stores, not to mention a multitude of farm stands in the surrounding countryside. The beautiful sand dunes that line the coastline in West Michigan are on display in Douglas and Saugatuck. The famed Oval Beach in Saugatuck has plenty of parking, restrooms, concessions, and the option of a daily or weekly pass. Saugatuck Dunes State Park encompasses two miles of Lake Michigan shoreline and several miles of trails. Prepare for a walk through the dunes to the remote feeling of this beach with limited facilities. Douglas Beach, Pier Cove beach, West Side County Park and Laketown Beach are lesser known and smaller scale accesses but can be fun to seek out and explore. 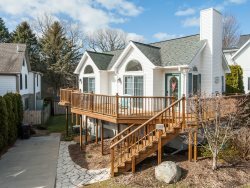 Select vacation rentals in Saugatuck Douglas are located along the river or offer views of Lake Michigan. We look forward to welcoming you to the Saugatuck Douglas area!